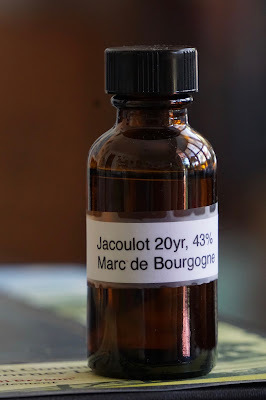 Jacoulot Marc de Bourgogne 20yo (43.0%): Last year I had a bottle of a 7 year old Jacoulot Marc de Bourgogne and I was blown away how good it was... Yes, I admit that I am a huge fan of all Marcs but that one was exceptionally good... This time I have its older brother on my desk, a 20 year old bottling from the same label. To sum it up quick before we move on; Marc is a French pomace brandy made with leftovers of wine making process... In this case because it is distilled and aged in Burgund it can also be called Marc de Bourgogne. Jacoulot uses only destemmed Pinot Noir grapes for its Marcs. Color: Light amber with distinct legs around the glass. Nose: Old Palo Cortado sherry, freshly picked wild mushrooms and green moss. Moist forest ground and wet old musty wood. Pickled grape leaves and pickled asparagus, wet sand and apple skin. I am missing the bright vegetal freshness of younger Marcs a little here. It is quite mature and balanced instead. Palate: Pickled grape leaves again and fresh dandelion leaves. Dill pickles and maybe also freshly chopped dill, cooked mushrooms and Roquefort cheese. Oak is dominant but not toasty and charred like we would expect from a very old whisky it mostly has a worn out feeling and packed with moldy and mossy qualities. More like a decaying abandoned wooden house instead of a barrel. Finish: Medium long... More sweet and less tart than the palate. Prunes and raisins.